For the last 50 years, Korkers has been providing traction and footwear solutions for general recreational outdoor use, and a host of outdoor job site uses. Providing traction on surfaces that can be slippery, Worktrax is a unique form of fall prevention safety equipment that has become widely accepted in the roofing industry. Footing on shingle roofs, tile roofs and shake shingles can be tricky during any sort of roof top work – With the WorkTrax, you can move about safer and easier. The WorkTrax XL size is designed for size 12 or 13 shoe. Korkers offers a full size selection for men and women, if you don’t see what you need here online give us a call! Designed to be light weight and also flexible to allow you to fit easily over a bulky boot. 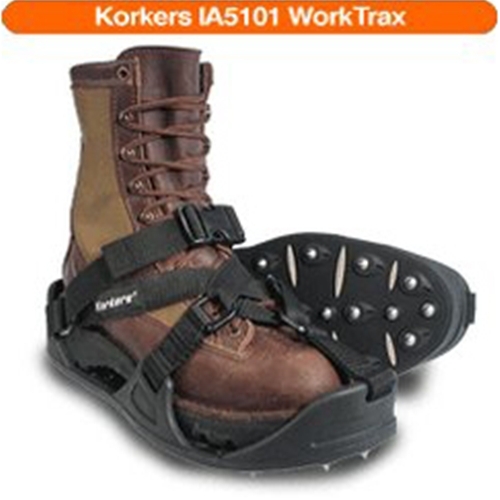 Insulated boots, specialized footwear and virtually any other type of work designed shoe or boot can be accommodated with the Korkers WorkTrax. The standard XL WorkTrax set comes with fast release buckles and strap system that allows you to easily take the WorkTrax on and off, but keeping them secure on your foot while you work. Each pair of WorkTrax features 28 push-through steel spikes. This regular spike design is ideal for shallow penetration on a rooftop, but Korkers also offers a Sharp Steel option for a deeper penetration. With Korkers, your crews can move faster and safer across a rooftop, even in wet conditions. Although additional safety equipment and fall prevention gear should be in place as needed, WorkTrax can be put to work on any jobsite to provide that added traction. Place your order for WorkTrax today with Intech Equipment and Supply. Call us and speak with our experts, or browse additional sizes online. For fall prevention, general safety equipment and more think Intech Equipment and Supply!